If you understood that which you are seeking to be accepted into and if you understood the nature of those whom you are seeking to integrate with you would, instead, be seeking your own people's society or building one of your own on some land or territory separate from the American whites. We need land wherein we can build our own society free from the tension, hatred and violence that have accompanied our race relationship with the white race of America. 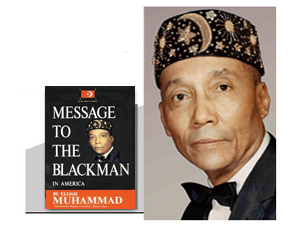 When you learn that the white man is not your brother, you will readily begin to see and accept the Divine Plan that Almighty Allah (God) has in the working for our people. Who has been our aggressors and murderers ever since we have been in America? Who, by nature, was made quick to shed blood -- even his own? And how much easier it is for them to shed our blood. They are heartless, merciless, when it comes to you and me we all know the true answer, whether you wish to bear witness with your tongues or with your hands, we know that the white man is our aggressor -- the hater of good, justice and equality for you and me. Do not expect your former slave-master's children to give you the privileges to do as you desire in his own house. According to the Emancipation Proclamation, we as a people were proclaimed free to go for ourselves. In other words, we were on our own to build a nation of our own regardless of our hardships and barriers. But this we did not do because we were unable and unqualified in the knowledge of self and how to build a civilization of our own. And today our people are too afraid and doubtful even though a way is being made in this wilderness by Allah (God) in Person. Many so-called Negroes despise and hate "Black Supremacy" without having knowledge of what this means, and yet they support and believe in "White Supremacy." If you say you do not either, then you are neutral. But nay -- some must rule over the other. It is the law of nature. The ex-slaves of America desire to go to their white masters' restaurants instead of building one for self and kind. You want to go to their schools and learn with white people who hate your very shadows. I say to you this is a disgrace to act so dependent and loving toward a people who have been your worst enemies and who will go to war against each other before they will give you and me equal justice under their own laws. Allah (God) is offering you heaven at once on accepting Him for your God, enjoyment and unlimited progress in the new world of universal peace and happiness, unlike anything seen, heard or imagined since the creation of the universe. You are not American citizens or members of the white man's world. The only American citizens are the white people who are originally from Europe. So why fight a losing battle by trying to be recognized as something you are not and never will be. I am not trying to disillusion you but merely telling you the truth. Almighty Allah came to make Himself known that He alone is God and beside Him there is no God His equal -- I know of none his equal. I am going to do my part in representing Him in teaching His words of Truth. We do not need soft talk when it comes to the truth, we need the thrust that will pull us off our knees from begging and put us on our feet as intelligent men and women no longer dependent upon the slave-master but striving to build an independent nation of our own as others have done before us. We the black people in America have to fight against great opposition coming to us from all sides -- the ignorant blacks and the wise, skillful whites who envy our progress in the way of self-support. They hate the wide spread of the Truth that Allah has revealed here in the worst part of our Planet Earth. A truck load of our papers MUHAMMAD SPEAKS was set afire by the envious and jealous haters of the progress this paper is making toward getting the Truth to the mentally dead of our people. Oh seek refuge in Allah from such evil, for I know a day that is coming to them when they will wish they, too, were Muslims.